Frederick Faber, who wrote the text of today’s hymn, was a Priest in the Church of England. 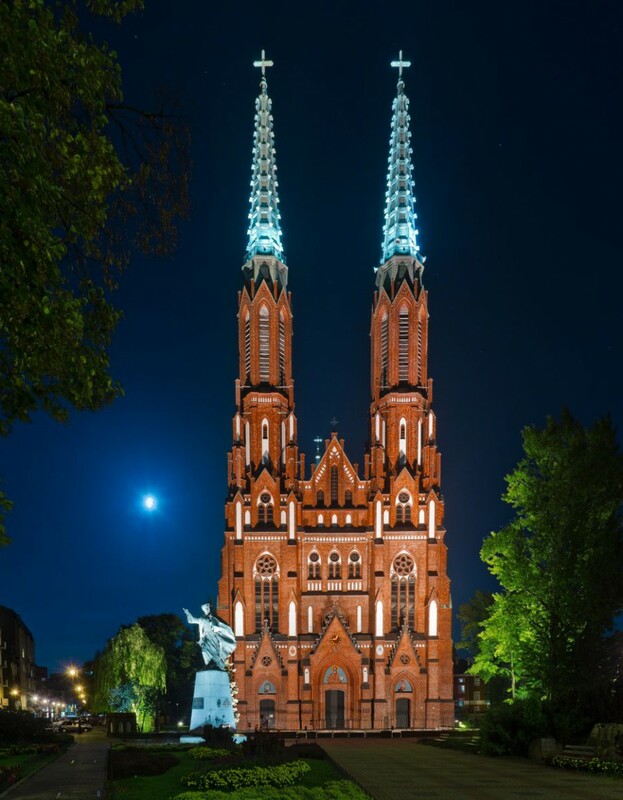 St. Florian’s Cathedral in Warsaw, Poland where I was assistant conductor and wrote my dissertation, a full-scale Catholic Mass. He really liked some of the Catholic ways of doing things and started introducing them in his Parish. He decided he wanted to follow a ‘monastic’ way of life and so converted to Roman Catholicism, the former official faith of his country. But that was before Henry VIII and all that mess with Anne Boleyn. Hankering for the ‘original’ faith, the “Faith of Our Fathers,” as he saw it, he penned the words to this hymn. But Faber hankered for his old “Catholic” home. I can relate to that too. I spent a lot of time with my Catholic friends when I was a student in Poland. I thoroughly enjoyed their company, their devotion (these are real Catholics, the Polish are very serious about their religion and their heritage). I admit to longing for a good old Mass on occasion. Though, I’m not a fan of the incense. It’s awfully hard to sing with a mouth and nose full of the fragrant smoke. We can relate to the sentiment in our church too. Our Pioneer heritage usually comes to mind when we sing this hymn, and the text, for the most part, works well from this point of view. The music is calm and nostalgic. There’s a lot of the 4 chord and the 2 chord, which add generous portions of the “longing for home” feeling. The repetitive, small range melody adds to this as well. It’s a simple tune, yet it has enough interest to keep us engaged. I like how the G suspends over to the 2nd bar and how the A leaps down to E in the 3rd. The chorus, music that was added after the hymn had been composed by Henri Hemy, adds yet another dose of homesickness. Borrowing the repeated 4 chord from bars 5 and 13, James Walton begins the chorus (or refrain) with the same repeated subdominants. The final few bars of the chorus borrows from the 1st bar of the tune making for a cohesive whole between verse and chorus. I think this is a lovely, solid hymn. It’s not in my top 20, but it’s a-okay with me and deserves it’s place in the new hymnal. This tune is a nice, dignified tune that fits the fervency of the text. It is representative of the kind of congregational music that the Roman Catholic revival movement in mid-nineteenth-century England inspired and drew melodic inspiration (though it is substantially modified) from plainsong. It is found today with this text in most hymnals of Christian faiths. This hymn is better thought of with a pulse in one rather than in three. It gives the tune more flow and direction than the plodding nature of a beat on each quarter note. A good tempo to achieve a sense of the pulse in one is the dotted half note equal to 40-41 beats per minute ( that is the quarter note equal to 120-124, but better to think of it in one…) I would use a registration heavy with fundamental sound, and maybe adding the principal 4’ as well. I would give consideration to adding a soft chorus reed later on.